"We believe it is our duty to society to achieve the impossible." 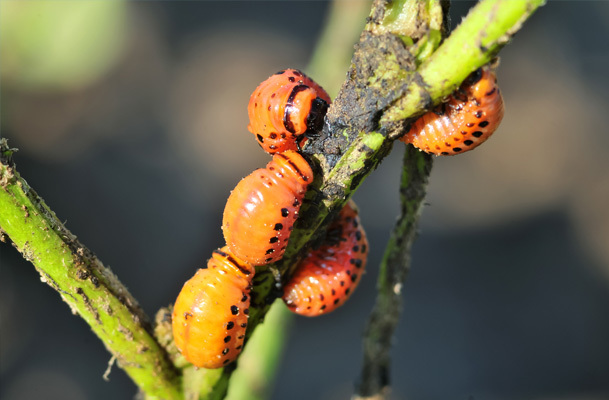 Control of agricultural pests and disease that have become resistant to traditional chemical pesticides. These are a small subset of what must be achieved to ensure global sustainable development. RNA has been shown to be a safe, ecologically-friendly and highly targeted means to address these problems. However, the high cost of RNA production has historically limited its widespread use. GreenLight Biosciences has developed a scalable process for cost competitive production of RNA, and is designing products to address many different in an economical, sustainable, environmentally friendly, and highly specific manner. GreenLight Biosciences’ proprietary Cell-Free Bioprocessing method to produce RNA significantly reduces manufacturing cost and has demonstrated scalability for a wide range of applications, putting us at the forefront of an RNA revolution. GreenLight Biosciences partners with some of the world's leading corporations, academic institutions, philanthropic, and nonprofit organizations to develop RNA-based solutions that work to address global needs. GreenLight Biosciences’ team of scientists work to manufacture RNA products for agricultural and life science applications including pest control and disease management by specifically targeting pests and disease vectors. RNA is one of the basic building blocks of life. RNA facilitates virtually every process in all living organisms. Controlling RNA biology allows precise targeting of biological processes. Over the last two decades, a global effort has demonstrated the utility of manufactured RNAs to regulate biological processes, opening up a world of possibilities. Despite the flexibility, efficacy and specificity of RNA-based solutions, their broad market adoption has been stifled by the prohibitive cost of large-scale RNA production. GreenLight Biosciences has developed a unique, proprietary Cell-Free Bioprocessing method to produce RNA. Our technology enables the cost effective and scalable deployment of RNA-based products across multiple industries, placing GreenLight Biosciences at the forefront of the RNA revolution. GreenLight Biosciences is actively pursuing commercialization of RNA based solutions that address global needs. Our scientists are working together and with leading collaborators to discover new targets while our experienced team of commercial leaders builds the relationships and markets to translate technology to impact. Agricultural pests affect every region on the globe. The estimated global crop loss to pest and disease is more than $100 billion annually. A lot of this loss is due to insects, weeds, viruses and fungi that either don’t have a current means of control or have developed resistance against traditional pesticides. At the same time, over 95% of the pesticides sprayed never reach their target species. The vast majority of the chemicals sprayed or applied end up accumulating in our soil, water or food; affecting beneficial insects such as bees and butterflies. dsRNA can be utilized to efficiently and specifically target the pest of interest through a natural process known as RNA interference (RNAi). RNAi is a process found in most living organisms wherein it acts to transiently control a variety of functions. We can take advantage of this process to control pests through suppression of key genes in a temporary and reversible manner. By matching the sequence of the native RNA encoding an essential gene in the target pest, expression of that gene can be disrupted, effectively silencing it, resulting in death of the target pest. In addition to directly killing pests, RNA can be used to control other processes vital to pest proliferation and virulence. For example, RNAi can inhibit wing development in insects, or can block herbidical resistance development in weeds. RNA interference is highly specific, in that its effects are confined to the targeted pest. A treatment that blocks wing development in one insect pest could be made completely innocuous to other beneficial insects, such as bees. GreenLight Biosciences has ongoing collaborations with leading agricultural companies to develop and bring to market integrated RNA solutions to significant crop pests. In addition, GreenLight Biosciences is developing proprietary targets for specialty crops. We are currently to initiate field testing some of these approaches. mRNA Vaccines constitute one of the most promising avenues to address global pandemics. These vaccines combine desirable immunological properties with an outstanding safety profile, as well as limitless flexibility to target rapidly-mutating pathogens. Several large pharmaceutical companies, as well as nascent biotechnology startups, are developing mRNA vaccines, both for human and animal use. However, speed of development and efficient, scaled manufacturing remain enormous challenges in making mRNA vaccines a commercial reality. The GreenLight Biosciences cell-free RNA platform is capable of producing high-quality, high-fidelity mRNA sequences suitable to be used in vaccine exploration. The unprecedented flexibility and scalability of our platform enables rapid development of new vaccines coupled with large-scale efficient manufacturing potential.